Penn was on the receiving end of many an accusing finger, where its dental school, which didn’t require any entrance exams, was a particularly handy place to fast-track young men into the college who you wouldn’t trust to go poking around any cavities in your mouth, but would be more than relieved to have standing next to you when slamming headfirst into tightly constituted packages of ogre flesh. 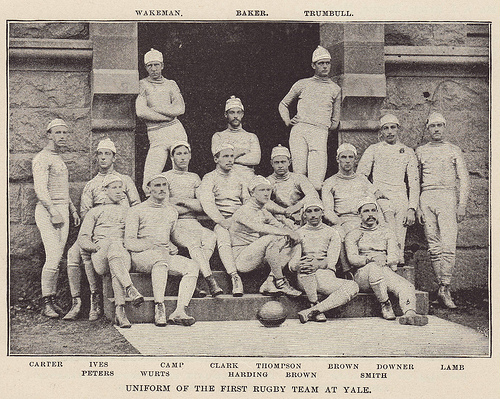 Rather like learning to play the guitar, the American colleges learned the basics of rugby and then let their imaginations do the rest. But a sport is like a Rubik’s cube, and if you move one piece, then all the others start moving too. The man with many of the solutions to the different problems that the intercollegiate game faced was Walter Camp, although this chapter questions whether some of ideas were entirely his own working. In came the snap to remove the unsatisfactory randomness of the scrum, which led to probably the dullest kind of football ever played until Camp rectified the situation by announcing that yards had to be won in a certain number of downs, and the field was marked out with its gridiron. Posted on November 15, 2011, in Uncategorized and tagged amos stagg, fielding yost, line of scrimmage, origin gridiron, pudge heffelfinger. Bookmark the permalink. Leave a comment.